Do you ever get caught by non-stopping anxious and irrational thoughts? Have you ever felt so nervous, fearing you might lose control or go insane? Are there times that you feel disconnected from what is going on around you? Do you ever feel short of breath, chest pain, heart palpitations, nausea, almost like fainting or having a heart attack? Are you feeling so nervous and on the edge in situations that never used to bother you before? These and many others are common symptoms of anxiety. Anxiety usually sets in as a result of some kind of physical, mental or emotional exhaustion. And in many cases this exhaustion comes as a result of some kind of chronic unmanaged stress. You may already have heard how chronic stress weakens our physical immune system, making us more prone to diseases; the same goes with our emotional and mental “immune system” making us more prone to all these irrational thoughts, worries and fears. I used to struggle with anxiety for quite some time; for years and years I kept getting in and out of this vicious cycle. I tried a lot of methods, some worked for me and some didn’t. I kept doing more of what it worked and ditching what it didn’t. What I found after all these years, is that although it may sound hard, we can successfully learn how to deal with anxiety, given the right information, guidance, and techniques (assuming there is not some kind of pathological condition involved). You are about to learn a little-known yet effective method that can really teach your brain how to deal with anxiety and even panic attacks naturally, without use of medications. If you take this method and actually put it in your life, you can reverse anxiety and start re-enjoying your life again in 30 days or less. And the best part is that you can practice this method even in your dead time; that’s time spent on repetitive activities, such us commuting time, waiting to pick up kids from school etc. Does this method work for everybody? Certainly not; nothing works for everybody. Will this method work for you? Hopefully it will; but you’ll never know until you give it a try. I don’t know how you landed on this page, but you should consider yourself lucky; you have a great chance to learn how to deal with anxiety naturally today. You may already know that if you don’t take action on treating anxiety, it could get more intense, leading sometimes to frequent panic attacks, or even depression. In most cases anxiety is not a physical or mental illness; it usually is a result of an over-sensitized nervous system, making us more susceptible to external and internal stressors. It’s like having lower back pain, leave it untreated for some time and it will get more and more sensitized leading to a bad back. The same goes with anxiety, if we leave it untreated, our brain gets over-sensitized and more and more susceptible to irrational thoughts, worries and fears. The problem gets worse, because as anxiety sets in, it can make us fearful of our own fears, making it even harder to escape from this vicious cycle! In other words, our sympathetic autonomous nervous system which controls the “fight-or-flight response” gets too hot and out of balance of our parasympathetic autonomous nervous system which controls the “relaxation response”. So one of the the keys to learn how to deal with anxiety naturally, is to desensitize our brain and balance our sympathetic autonomous nervous system with the parasympathetic one. Since anxiety is fueled by the autonomic “fight-or-flight response” we can hardly control it by just talking to it, as we cannot talk our heart on how to beat or our digestive system on how to process food. The trick is to work on our autonomic responses indirectly, by training and conditioning how our brain responds to internal and external stimuli! And here’s where sound therapy comes into play. Sound therapy originates from ancient times when shamans were beating their drum not only to enter into altered states consciousness, but also to offer healing to their people. From the didgeridoo of the Aboriginals of Australia to the Roman Aulus Cornelius Celsus who advocated the sound of cymbals and running water for the treatment of mental disorders, sound vibrations were used from ancient times for healing, by tweaking brain’s activity. Today we know that a rhythmic sound has the power to alter our brain wave patterns driving the mind into a relaxed or even to a deep meditative state. Sound therapy can help you alleviate anxiety by re‐training your brain to relax, cooling down your “fight‐or‐flight response” and nurturing your “relaxation response”. Through sound therapy you are going to lower your general anxiety levels and you will retrain your parasympathetic system by empowering your “relaxation response”. Measuring anxiety & stress levels to a scale from 1 (totally relaxed) up to 10 (full blown panic attack), you should aim for a normal base level of 3‐4. When your base level climbs at 6 – 7 you are becoming extreme sensitive to stressors, since a little more stress can blow your anxiety level to a 9 or 10 setting you up for a panic attack. As an added bonus, by lowering your stress levels you will be more productive and you are going to get more things done in the same time, thus lowering your anxiety levels even more! You can begin using sound therapy and other powerful techniques to reduce your overall stress and anxiety levels right now. Your goal is to become overall calmer, immunizing yourself day by day from anxious thoughts and panic attacks. This is much simpler than it sounds, and you can go for it today. 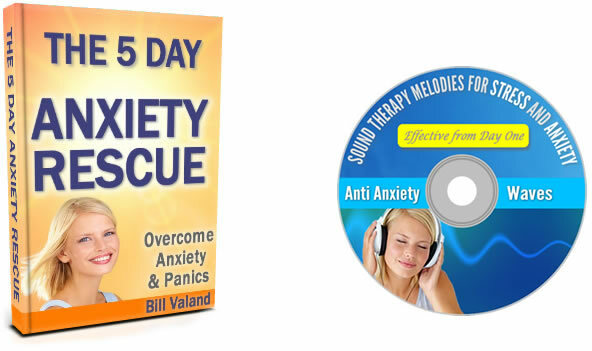 Whether you’re struggling with general anxiety, panic attacks or even phobias, the 5 Day Anxiety Rescue gives you the starting point to deal with anxiety and live the life you deserve. Thanks for your kind words Nicola! You can find a lot of resources at the antianxietywaves blog and you can also try this free rapid relief audio from Barry McDonagh. Barry is an expert on teaching people to overcome anxiety and panic attacks for over ten years. His methods are excellent and besides this first aid anti-anxiety audio he offers a ton of free advice and resources to help you get over anxiety and panics. I have anxiety that comes and goes about health issues. The health issues I have worried about have been checked out by a doctor and I’ve been told that I have nothing to worry about. What’s the best way to cope with anxiety like this when an intrusive thought comes to mind and I start to ruminate? The best way to deal with anxious thoughts is by just acknowledging them. Don’t try to stop them. By trying to stop them you engage your fight-or-flight response, you fortify them and your body gets in anxiety mode with all these strange sensations. Also practicing some relaxation helps a lot; try the sound therapy recordings and the vagus nerve breathing technique and you’ll be amazed by the results. feeling of fears,unadaptable,fears of heights,shaking of body and shortness of breath, palpatations, sweating on the palms of foot, sometimes acidity and many more …. Being 3 years in anxiety can make your nervous system quite over-sensitive and that could be the root cause of all these anxiety symptoms you are going through. You could start with some anti-anxiety relaxation techniques to cool your nervous system down; there are many options in this blog, try the vagus nerve diaphragmatic breathing technique and of-course listen to the anti-anxiety sound therapy melodies. Maybe you should see a therapist too, to find out about the root causes for your anxiety; but practicing relaxation is a must to help yourself deal with anxiety. Take care and feel free to contact me for any help with the techniques and for any further info. As a first step you could (if you haven’t already) download and read the ‘How to Deal with Anxiety’ pdf guide and try the anti-anxiety relaxation recordings. What kind of anxiety do you have; I mean is it some kind of general anxiety, do you get panic attacks, too much worries, what kind of symptoms bother you the most, what kind of results are you looking for? If you need more personal advice, please contact me at bill@antianxietywaves.com, I read every email I get and I do my best to help. It’s great that you’re running regularly both for your general health and for dealing with anxiety. Cardiovascular exercise releases endorphins that make us feel great and reduce anxiety a lot (I am jogging too a little bit, I’m much more in cycling). As far as I know there isn’t a general rule for breathing when running or cycling, speaking of myself I’m trying to take full breaths; that is when inhaling I’m filling first my belly and then my chest with air (in a continuous form) and then I leave exhalation to take care of itself. When you are breathing for relaxation it’s crucial that exhale is LONGER than inhale, when running I don’t think it really matters, just try (whenever is possible) to breath in through the nose. I just returned from vacation and I feel so anxious going back to the office. Any advice? Join the club, I just returned from vacation myself and I feel this September’s post-vacation anxiety. Feeling this way for a week or two it’s quite natural. You can further deal with anxiety (and keep this relaxed state of vacation) by accepting come back reality and maybe listening to these antianxiety recordings. My apologies for the late answer but it’s been vacation time for me… I hope that it’s all gone by now, but I’m giving some answers anyway in case it comes back and for people with similar issues. The odds are that all these are symptoms of anxiety. Anxiety can play various tricks with our minds and it’s quite common to have a lot of irrational thoughts. I used ot have a lots (and quite worse) of them but thanks God they belong to the past. I think the key is not to try to stop these thoughts or fight them back. You see the most you are fighting to get rid of them the most you stimulate your brain’s “fight-or-flight response”, fueling this vicious cycle. So please accept them and even dare to intensify them. (that’s not mine that’s Dr. Victor Frankl’s “pararadoxical intention” aka dealing with anxiety and fear by asking more of what it scares you). These thoughts are all part of you, think of them as a spoiled child trying to grab attention, there is some reason for this to happen. Apart from dealing with these thoughts you should also do something to calm down your nervous system. If you have been anxious for quite some time the odds are that your nervous system has become quite sensitive and maybe that’s the reason you are getting easily irritated. Maybe you could practice some kind of relaxation, please feel free to download (if you haven’t already) my antianxiety recordings; they can really help you deal with anxiety by relaxing faster and deeper. Also please have a look at the Deal With Anxiety Using Your Vagus Nerve post and practice this breathing technique. Proper breathing is absolutely essential for dealing with anxiety and you could help yourself sleeping better by practicing this technique at nighttime before going to sleep. Hope that helps, please feel free to contact me for any further info or help. Hi, thanks for sharing this info, how long do you think it will take me to learn how to deal with anxiety in business meetings? Maybe you should see a therapist to find out if there are any unhandled emotional issues that are causing this kind of anxiety. Also is there something that it is stressing you lately; any kind of physical, emotional or mental stress? Unmanaged chronic stress is the number one cause of anxiety. Meanwhile you could also try some kind of relaxation for dealing with stress and anxiety. There are many options in this blog, try diaphragmatic breathing and of-course listening to some kind of the anti-anxiety relaxation music. Sometimes just the decision to take some kind of action to deal with anxiety can work miracles on breaking you free from this vicious cycle. How can I deal with my anxiety/stress? I tend to over-think about everything, especially when I’m thinking about the future. I keep telling myself not to worry so much about the future, but I can’t seem to stop it. 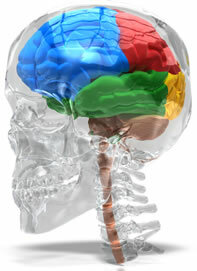 Maybe all these anxiety and worries have made your nervous system quite sensitive. This forms a vicious cycle where your mental “immune system” weakens, making you more susceptible to more anxious and irrational thoughts. In order do desensitize your nervous system you could practice some kind of the relaxation method(s) you are about find in this blog. There are quite a few of them, maybe some breathing along with some anti-anxiety relaxation recordings can help you to deal with anxiety. I’m 21 years old and I’m dealing with anxiety for 2 years. I’m going on a vacation with friends and I can’t stop worrying about what am I going to do if I’ll feel bad… Should I go for these vacation or stay back home? You see one of the worst things anxiety does to us is making us avoid situations that are making us (or that we think that may make us anxious). In the other hand you can see these vacations as an opportunity to start dealing with anxiety for good by facing your fears and practicing some relaxation techniques. In a strange way, most of the times, life gives to us what we are expecting from it; if you go on vacation fearing anxiety attacks, anxiety attacks will be there for you, if you go on vacation with the intentions to deal with anxiety for good that’s what it will happen, it’s totally up to you. Anxiety can cause a variety of symptoms, sometimes affects our body with chest pain, nausea or heart palpitations, sometimes our mind with non-stopping anxious and irrational thoughts and sometimes our emotions through fear and worries. You can start by practicing some of the relaxation methods on this blog and you could also eal with anxiety by soothing your nervous system with these anti-anxiety relaxation recordings. Most effective way to deal with anxiety attacks? Maybe these exams put a lot of stress on you, making your nervous system more sensitive to anxiety. So that sensitivity could be the reason of your recent anxiety attacks. In order do desensitize your nervous system maybe you should practice some kind of relaxation technique. I am about to give a presentation and I feel quite nervous about it. Which is the best way to deal with anxiety for my presentation ? Breathing is maybe the most important aspect on dealing with anxiety and nervousness. Try 7-11 breathing, breath using your diaphragm, that feels like inhale like inflating a balloon in you belly for a count of 7. Then pause for a moment or two and then exhale slowly counting up to 11. Repeat 6-10 times focusing on relaxing your neck and shoulders and you’ll much much better. How about feeling anxious about being anxious? Is it normal getting anxious with just the thought of having anxiety? Some times chronic anxiety over-sensitizes our nervous system, making us having physical anxiety symptoms without (consciously) feeling anxious. So that sensitivity could be the reason of your anxiety symptoms. How can i deal with my major anxiety, sometimes I feel anxious for days and I often cry almost for no reason. Meanwhile you could also try some kind of relaxation for dealing with stress and anxiety. There are many options such as progressive muscle relaxation, diaphragmatic breathing and ofcourse listening to the AntiAnxietyWaves relaxation recordings. So download and read this How To Deal With Anxiety guide and reserve 15′ everyday’s dead time for practicing relaxation. I am always overthinking too much, especially when ever I am thinking about the future, having ugly irrational thoughts. What can I do to cope? Maybe all these anxious thoughts and worries have made your nervous system quite sensitive. This forms a vicious cycle where your mental “immune system” weakens, making you more susceptible to more anxious and irrational thoughts. You can deal with anxiety and desensitize your nervous system by practicing some kind of relaxation methods, such as a combination of mindful breathing along with these anti-anxiety waves relaxation recordings. How about having physical anxiety symptoms without feeling anxious? Some times I am having nausea, palpitations and other anxiety physical symptoms without really feeling anxious. How’s that come? So that sensitivity could be the reason of your physical anxiety symptoms. In order do desensitize your nervous system you could practice some kind of relaxation. I’m concerned about being happy lately. I’m feeling very anxious and depressed, I’ve lost my appetite for life and I feel so exhausted! Can you please help? I don’t really want getting meds… Any ideas please? What is the cause of panic attacks? I’m having 3 and 4 panic attacks a day. I talked to my doctor and he just wrote me a prescription for valium. The thing is that I am not I want to go with it, can you give me some tips for dealing with panic attacks and anxiety without medication? Panic attacks are usually caused from an over-sensitized nervous system, which in most cases is a result of chronic unmanaged stress. This accumulated stress makes our brain more sensitive not only to our environment, but even to our own irrational thoughts. The problem gets worse because after a couple of panic attacks we may become fearful of our own fears (fear of unexpected panics, fear loosing control etc). For more information feel free to download the How To Deal With Anxiety guide, it contains a lot of useful information on dealing with anxiety and panic attacks. Best way to make anxiety and panic attacks go away faster? I keep having these constant grey thought coming all over my mind, can you please help? Relaxation can help a lot dealing with anxiety and panic attacks. It’s better to practice it when you feel calm, since trying to practice relaxation (at least for the first times) during a panic attack is almost impossible! You can also relax your emotions by focusing on your heart area feeling grateful about somebody or something you love, since fear and love cannot coexist in the same time, it evacuates fear. Take care that your exhale is longer that your inhale, since that balances O2 – CO2 exchange, while stimulating at the same time your vagus nerve that controls your relaxation response. Trying to fight anxious thoughts brings even more anxiety since it fuels your fight-or-flight response, which is actually causing panic attacks! When I get anxious I go lightheaded and my hands go numb. I am starting deep breathing but these feelings get even worse! It seems like you are hyperventilating, that means that you breathe too fast and too deep. This actually depletes your body from carbon dioxide (which despite common beliefs is quite essential for our body). That results to vasoconstriction (meaning that your blood vessels constrict), and that not only makes your blood pressure rise but it also restricts blood supply whole body. That reduced blood supply means reduced oxygen supply to your whole body and especially the brain causing all these awful symptoms of a panic attack, and that’s probably what makes you dizzy and numb. Toy should breath really slow taking care that your exhale lasts more than your in hale (e.g. breath in counting to 7, hold for a second and then breath out counting up to eleven). Breath this way and hopefully you’ll see the symptoms disappear. You can also deal with anxiety and panics by learning the relaxation techniques found in this site, so you can lower your overall anxiety levels too. I have general anxiety disorder and I am starting a course tomorrow so i am freaking out! I have been seeing a therapist but not long enough to learn how to deal with it. Can you tell me how to cope? Deep and especially SLOW breathing helps a lot. You can also deal with anxiety by working on lowering your anxiety levels, using some of the info and recordings found in this site. You should still see a therapist, especially if the problem persists. I think I may had a panic attack yesterday. While in the shower, I became short of breath, felt as if I would pass out, and my heart was pounding. After I sat for a while (about 20 minutes) until the symptoms went away. Deep breathing helped. You may had a panic attack but don’t keep thinking about it too much. Deep and especially SLOW breathing helps a lot. You can also deal with anxiety and panics by working on lowering your anxiety levels, using some of the info and recordings found in this site. I had an important exam and the night before the exam I couldn’t sleep. I was very anxious and crying. I am always afraid of the future and sometimes I panic. Is there any practical solution other than consulting a doctor? I think this will come to an end only if my personal problems and professional problems get solved. You should go for solving the problems you’re talking about, but you should also work on the way you respond to these problems. Life is full of problems and some of them are beyond our sphere of influence, but we can work on responding to them instead of fighting them. I think that reducing your overall anxiety levels by learning to relax would be a great help for you and here you can find some nice and effective methods to deal with stress and anxiety and even insomnia.